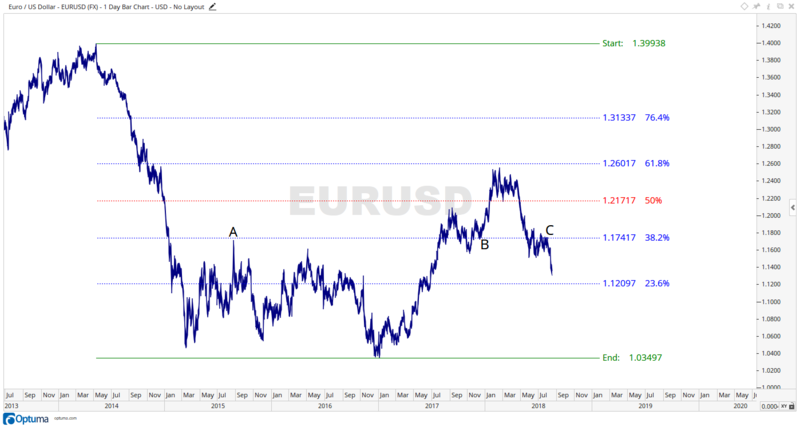 This week we review EURUSD Daily chart…. The EURUSD chart has a fabulous example of the Fibonacci Series providing support and resistance levels. It is most important to understand the synergies of support and resistance, probably the most significant aspect of successful trading. Once a market creates a support point, it may react to this level at any time in the future, either again as support or even as resistance at the same price. On the attached chart we see a major top May 8 2014, and from here the next lowest price is January 3 2017. Between these two significant points we can create a Fibonacci scale and as you can see, the latest tops at point C are right against the 38.2% Fibonacci level. I like to see as much evidence as possible and not just rely on one tool or aspect, but in this case I have marked point A and Point B where at the same price, this market has experienced major and significant changes of trend. This just adds weight to a potential reversal, and on the daily chart the market tried 5 times in July to cross above the Fibonacci level but every time higher prices failed. This kind of information is crucial to successful trading in any market and in any time frame.